Block a pan oil and shallow fry cheese with butter until the golden spots appear and the cheese becomes soft. It is the same for flip and the other side, cut into small cubes and keep aside until needed. Add more butter and some oil in the same pan and once the butter melts, add the cardamom, cloves and mace. Then add the onion paste and the ginger-garlic paste and start the sauteing. Once the onion paste starts to be well sauteed and golden brown, insert the tomato purée. Close and cook for 2-3 minutes and then add the spice powder (excluding garam masala). Cook until the tomato is fully cooked and shrinks to a paste and begins to drop the oil. Then add one cup of water and boil it. Add the cashew paste, stir well and cook for another 3-4 minutes. Sugar add and sprinkle garam masala, add crushed kasuri methi and stir well. Throw in shallow fried cheese crumbs and allow the Uhe to absorb the flavors for 3-4 minutes on the Med-less flame. Then place on the lower flame and add the cream and give a stir. After 2 minutes turn off the stove. Transfer to a serving bowl, garnish with a few more creams and serve. My suggestion: You can also replace cashew paste with almond paste or watermelon seed paste. Sugar rebalances flavour and acidity of tomatoes. Shallow frying cheese is optional, you can also fry it deep, but I don't like it completely. 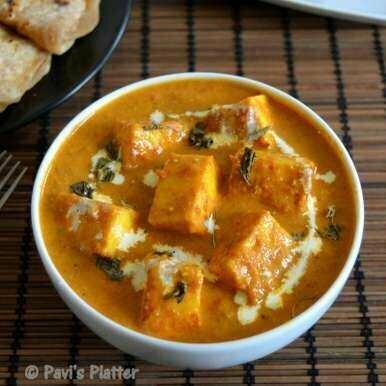 Or soak the paneer in warm water till the sauce is ready. That's the ideal way.